We work in a data-centric world. Managers are bombarded with data via reports, dashboards, and systems. We're regularly reminded to make data-driven decisions. 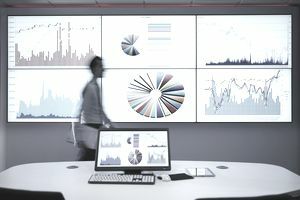 Senior leaders salivate at the promise of Big Data for developing a competitive edge, yet most struggle to agree on what it is, much less describe the expected tangible benefits. The role of data scientist is in hot demand with projected shortfalls in this emerging, important role expected for years. Organizations are spending a fortune every year installing software to capture, store and analyze data. Marketing departments are increasingly filled with technical, data-savvy professionals at the expense of creative roles. The world of business is a data-focused world, yet it is important to recognize that data is not an end unto itself. Like everything else we draw upon in our work, data is a tool filled with promise. In the right hands with the proper approaches, the potential for data to support decision-making is remarkable. However, don't get lulled into the false belief that acquiring and analyzing data is without risk. Let's rub a bit of the polish off of the idea of data as business savior and help identify some of the potential pitfalls this new resource presents for all of us. While we are accustomed to thinking about quality in the context of physical objects or products, it turns out data quality is a material issue for every firm all of the time. Data stored in structured databases or repositories is often incomplete, inconsistent or out-of-date. It is likely you have been on the receiving end of a simple example of a data quality issue. Most of us can recall receiving duplicate mailings from marketers addressed to slightly different or radically different versions of our actual name. The marketer's database contains duplicate records with our address and different, often erroneous spellings or variations of our name. We recycle the duplicate mail as junk, and the marketer incurs excess costs in the form of printing and mailing all due to a simple data quality issue. Amplify this mistake by many hundreds or thousands of records and this small data quality error turns costly. The issue of data quality grows in importance as we strive to make decisions on strategies, markets, and marketing in near real time. While software and solutions exist to help monitor and improve the quality of structured (formatted) data, the real solution is a significant, organization-wide commitment to treating data as a valuable asset. In practice, this is difficult to achieve and requires extraordinary discipline and leadership support. Data is everywhere in an organization. Consider customer data. Most organizations have become skilled at capturing information about customers and prospects. Marketing collects data from people who attend live or web events or who download content. Executives use data to support or define new strategies. Sales collect data about customers involved in the sales process. Customer Support captures information about calls and chats. Management teams draw upon data and key metrics for scorecards. Customer data is used in accounting for billing purposes and by quality and customer insight teams for monitoring customer satisfaction. We capture customer information in a variety of different software systems, and we store the data in a variety of data repositories. One Global Fortune 100 firm recognized as much as 10-percent of their customer data was held locally by employees on their computers in spreadsheets. Another organization regularly polls their sales representatives for business card data before running marketing campaigns. Much like the ocean-going sailor stranded in a lifeboat after his ship sunk, there's water everywhere, but not a drop to drink. We have the same phenomenon in our businesses. Data is everywhere, and increasingly data is available from social and search feeds in real time. If the data is not easily accessible or, if we have duplicate or incomplete data, we are unable to leverage it for its intended purpose. Increasingly organizations are integrating their disparate software applications and simplifying the process of collecting and aggregating data across the enterprise. Along with data quality, however, this effort is expensive, time-consuming and it never ends. We are making more and more data at a pace that is difficult to comprehend. Experts suggest that every two years (and shrinking) we are creating more data than existed on the planet earth for all of civilization. Most of this new data is unstructured, versus that type of data that is neatly entered into our software and database applications. For example, all of the tweets about your product or brand represent a potential treasure trove of insights, yet this data is unstructured, increasing the complexity of capturing and analyzing it. While there are many software offerings to help with this challenge, the unstructured data represents a new torrent of raw material for processing, with all of the inherent complexity and quality issues discussed in this article. Data analytic software is only as good as the data feeding it. The common thread in this issue of leveraging data for advantage is quality. While many firms invest significant dollars in powerful new data-crunching applications, crunching dirty data leads to flawed decisions. Beware of blindly trusting the output of data analysis endeavors. You must be confident that you can trust the data used in the analysis. We accept the output of data analyses as conclusive, but it is not. In reality, data analysis most often showcases correlation, not causation! It is easy to fall into the trap of trusting the output of data analyses and confusing correlation with causation. Correlation showcases a relationship, but it in no way implies that A causes B. Establishing a causal relationship is nirvana for making accurate, insightful decisions. It is also incredibly difficult to prove. If you inordinately trust an output and assume a causal relationship where none exists, your decisions will be fatally flawed. Our cognitive biases are amplified when it comes to evaluating data. As one wise data scientist once intoned, "At the end of the most complicated and exhaustive analysis of data, a human being still has to draw an inference and make a decision." And when we reach that point where we have to assess the meaning of the data analysis, our biases come into play. Many of us tend to trust or rely on data that supports our positions and expectations and suppress data that does the opposite. We also trust data from sources we like or, we rely on data that is the most recent. All of these biases contribute to the challenges and potential for mistakes from our data analyses. Developing an enterprise-wide data strategy is critical for every business, yet is beyond the scope of this article. Instead, here are seven ideas you can use as a manager to improve your use of data in your daily decision-making. Recognize and mitigate the potential for biases. Seek out data that expands the picture or conflicts with the data in front of you. Encourage an external observer to evaluate your assumptions around data. Strengthen your understanding of data management. There are ample free sources of insights on the web, and many organizations offer seminars or workshops on data analytics and business intelligence. Many universities have added courses for this booming field. Keep sharpening your skills. Ask yourself or your team, "What data do we need to make this decision?" Too often, we rely on the data at hand and ignore the need to seek more data to complete the picture. Be critically aware of the difference between correlation and causation. As described earlier, confusing these two is a potentially dangerous pitfall for decision-making. If your firm does not have a data quality or master data management commitment, invest the time to evaluate your data for obvious errors, including duplicate, incomplete or erroneous records. There are many commercially available software applications or to support this activity, and many firms draw upon the expertise of data experts to query and assess the data quality. Also, consider external service providers who can help cleanse the data for you. Importantly, focus on continuously improving the quality of your data. Advocate for stronger data quality and management efforts across your firm. This work has often been the domain of IT or technical professionals, yet data has the potential to serve as a strategic asset. Every manager must care about the firm's ability to better leverage data for decision-making and strategy execution. Add technical and data-savvy talent to your team. Sales and marketing departments understand the power of engaging individuals skilled in the latest technologies and competent at navigating many of the data challenges outlined in this article. Technology and data are no longer the domain or responsibility of a single function in an enterprise. The firms and managers who learn to leverage data for improved decision-making will win in the marketplace. These organizations will be able to monitor and respond to changing conditions, and emerging customer needs faster than their data challenged competitors. They will be the first to glean insights from social media dialog, and they will win the battle to know and engage customers at a deeper level—all based on data. This is not a fad, but rather a new reality of managing and competing in today's world. Just watch out for the pitfalls on this journey.